Join Respite Care Charleston's social day program for adults with Alzheimer's disease or other forms of dementia on Fridays at Martin Luther Church in James Island between 10:00am and 1:45pm. 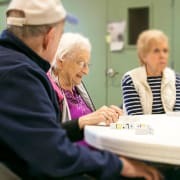 A genuinely FUN experience, you'll work with our program participants on memory games, arts and crafts, light exercise, music therapy and other social activities designed to stimulate them in a positive and uplifting environment. Volunteers can help with meal preparation, serving and/or clean-up; assisting with planning and coordinating puzzles, games and arts and crafts; or other activities related to RCC's mission of improving the quality of life of those living with Alzheimer's or dementia. Please contact us to schedule your first visit! Interested in getting involved but not available during program hours? Please contact us about volunteering on a committee to help with marketing, special events, fundraising, finance and other activities.